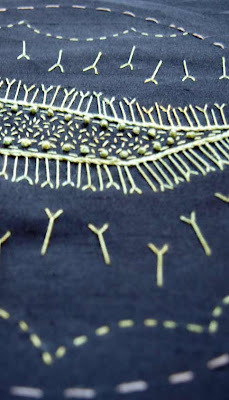 This is a section of the first embroidery piece. It is complete, I think – for now, at least – mostly because I ran out of that particular colour of silk thread and I don't want to introduce a second colour to the design. I used long-legged fly stitches around the central 'tooth', to represent the baby neurons reaching out their arms (or is that wings?) to make connections with loose thoughts floating around in the brain. QBI's Dr Elizabeth Coulson said a baby's brain generates roughly double the number of nerve cells it needs to function; with those cells that receive both chemical and electrical stimuli surviving, and the remaining cells dying.